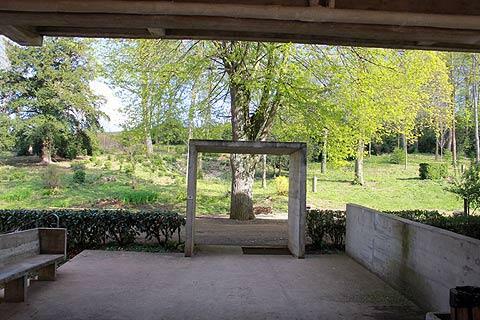 Eveux is a small village known for its unusual monastery, the La Tourette Monastery designed by Le Corbusier. It is in the Rhone department in the Rhone Alpes region 25 kilometres north-west of Lyon. France This Way comment: if you are an enthusiast of modernist architecture and Le Corbusier, you will want to visit the Sainte-Marie Convent of La Tourette - others might wonder why a concrete monastery is a part of their visit to the region: it is better described as interesting than beautiful, especially the outside, although inside there are some colours to lift the spirits! This quiet village suddenly gained international awareness in 1959 following the completion of the La Tourette convent on the hill overlooking the village. 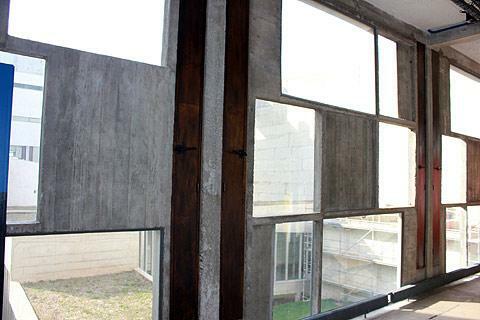 The La Tourette convent was designed by Le Corbusier and was in fact his last important work in Europe. 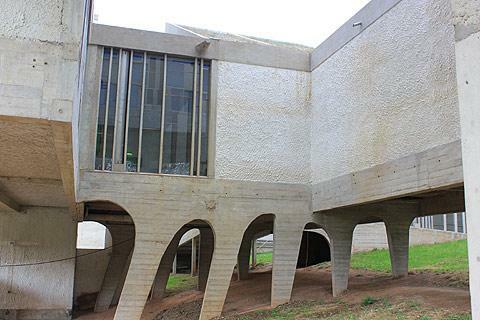 It is widely considered to be one of the key works of the Modernist period of architecture. 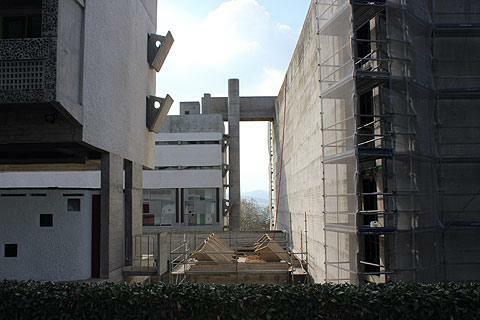 Le Corbusier designed the monastery with 100 cells, communal libraries and classrooms and a refectory as well as a church and rooftop cloister. It was built for a community of silent monks renowned for their austerity. 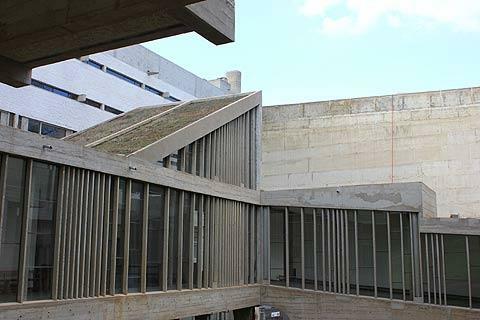 The convent is built in concrete and its lines are very simple and austere, the severity alleviated by Corbusier's trademark strip windows. 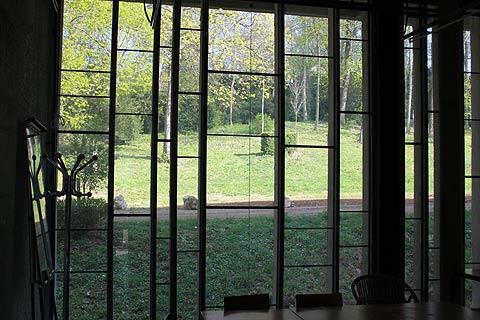 In fact it is these windows that, particularly from the inside, give the building much of its beauty. The whole building, and the church in particular, is very austere. Careful use of natural light and bold colour give the church a warm glow to counteract the severity of the straight walls, high ceiling and concrete finish: the angles of the windows are very carefully designed to maximise light inside the building. The monastery is set on a sloping hillside with excellent views over the surrounding countryside. I understand that the building is built on concrete pillars so that it has less visual impact on the environment, so it is perhaps a shame that the ground beneath the building is bare earth and not grass, but it is nice that the surrounding meadow goes right up to the building. If you would like to visit, the convent is open to guided visits and it can also be visited for one or two nights to take advantage of its quiet spirituality for personal reflection and meditation. 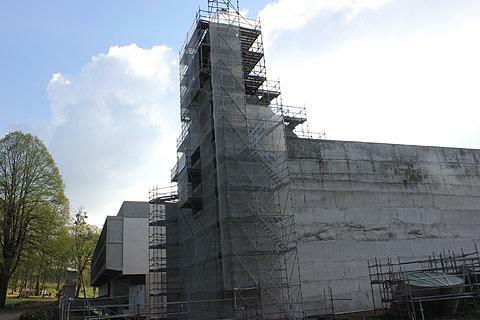 It is also available for overnight stays to archeology students visiting the monastery. The Cité des Etoiles is just South of Lyon and is an apartment complex designed by Jean Renaudi and built in 1976 to 1982. The Quartier des Gratte-Ciels (skyscraper quarter) in Villeurbanne on the edge of Lyon is another 'Utopia', a new style of apartment complexes built in the late 1920s. Also in Lyon is the Cité Industrielle designed by Tony Garnier. 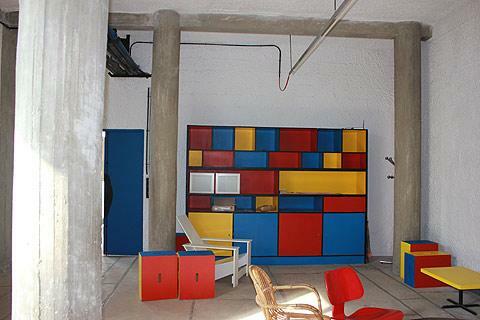 Le Corbusier fans will want to visit Firminy-Vert with apartments and a church (L'eglise St Pierre) designed by Le Corbusier. This is a bit further away though - to the south-west of Saint-Etienne. By contrast, you can visit the group of villages including Oingt, Theize and Bagnols to the north of Eveux to admire the traditional architecture of the region!